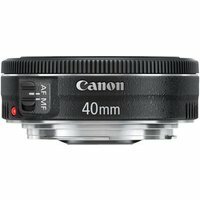 The Canon EF 40mm F2.8 STM lens is an extremely compact and fast pancake lens. With stepping-motor technology for quiet, accurate focus operation, and a fast f2.8 aperture, the Canon 40mm lens is perfect for capturing sharp photos that stand out whilst providing a professional and natural-looking background blur. The Canon EF 40mm f2.8 lens comes in a portable, lightweight package and is suitable for a wide variety of subjects, from discreet portraits to landscapes.